Lebaran or Eid Mubarak is an important religous celebration by the Moslem worlwide to mark the end of holy month of fasting period. 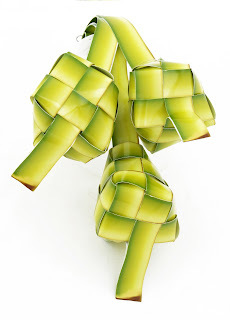 In Indonesia, Ketupat is the must have food for the celebration. Ketupat is a kind of steamed rice dumpling packed in a diamond shaped woven palm leaves. Every year I see Christmas wreath everywhere but I hardly encounter any Lebaran Wreath, so this time I decided to create a special Lebaran Wreath by combining Gerrberra, Roses, Hydrangea, Daisies, Carnation and Ketupat.